... we pick up the action just west of White Cloud, KS., making our way into town on 315th Road, which would become Main Street in White Cloud, KS. Along the final stretch of 315th Street, which runs east out of White Cloud, I remembered November having been particularly rough. This, the tail-end of a seemingly endless leg of northeast Kansas chipseal backroads from US-75 to K-7 at White Cloud, isn't REALLY that long - barely 35 miles, all told - but the rougher-than-normal roads make it seem far longer. In November, it was quite a mind-job being the first time we'd ridden it. Now, time and space became compressed as I knew what to expect. The anticipation had been worrying enough, however, that I'd decided to swap my recent-fave Specialized Espoir 25mm tires for the extra cushion of my trusty Panaracer Pasela Tourguard 28mms. Not sure it'd made a difference or not, but I'd like to think it had. After a slight uphill grade heading into town, Glen and I enjoyed a long, fast downhill to the river... well, I had been enjoying it until my empty water bottle ejected from it's cage, having wiggled itself mostly-free on the jarring chipseal which were were about to leave behind for good. A quick u-turn up the steep grade, and recovery. I'd have full bottles again soon enough, I remember thinking: only a few miles to Fanning, KS., and a pop machine with bottled water, along an otherwise deserted stretch of ghost towns. It was 4:00pm. No worries. With rising temps most evident during the hottest part of the day, however, water consumption was up... a big difference from November's edition, but, at least I'd been managing to drink enough, and I had packed a spare 20oz. bottle in my saddlebag, for good measure. In my mind, all things not really being equal, I still felt fresher and stronger for many reasons: the anti-fatigue factor of the extra air volume in my tires, the nutritional goodness I'd been enjoying all day, the strength which simply didn't exist back in November, the sunshine and warmth, and relative lack of wind - all things aligned with Glen and I checking-off a respectable finishing time on this 250km monster-loop. 12-hours or less. Glen knew it, and I knew it. The only piece of the puzzle from November which had seemed to go off perfectly had been the K-7 paceline trio which had pulled Terry, Glen and me back from the brink of near-depression concerning our pace. Today, we'd be even faster on the glassy-smooth run down to US-36, and then back over into St. Joseph for the finish. 4:00pm. K-7 in sight at the end of Main street, the flowing river beyond it. Thirty-five miles to-go, and our solid average of 16.5MPH - despite the bumpy pavement and occasional hilly section - seemed to indicate that once back on smoother surfaces, we'd simply fly. Smiles couldn't have been wider. We even paused for a moment to chat with White Cloud's local historian, who'd happened by as we coasted through town. As I'd mentioned at the end of Pt.1, this is where the pictures stopped. Glen, not really keen on stopping for a quick bite or a drink, made the turn south onto K-7, and I followed. Initially, the speed DID go up - but, something was different. Instead of the glassy-smooth asphalt I'd remembered, the surface showed signs of recent grading, with tell-tale, faint cross-hatch scratches running parallel to our path of travel. Still, most of the pavement was in good shape - so it became a game of dodge and steer. I do remember quite a few hunks of pavement missing off the edges of the road, but nothing terrible - so, maybe KDOT is just giving it a once-over close to town. It shouldn't last long. With each passing yard, however, it seemed I had been incorrect in my assumptions. The larger hunks of missing pavement still existed, yet, everything surrounding them had been subjected to deep grooving and grading. Frustration set in. In my personal realm of preparedness which exists to help guarantee success and enjoyment for my riding, I make a point to hit the state and county websites in search of road construction information. If a route is closed, I don't have to find out the hard way - or at least I know what I'm up against, and what I can use as a detour. This excursion had been no different - and, even searching later that evening after arriving home, I had found no record or mention of roadworks for this particular stretch of highway. Still, there had been no sign of road construction equipment on, or alongside, the road -- so, they could have done this work months ago, and with the road still open to traffic, maybe they didn't feel it worth mentioning? Quietly cursing whomever had been responsible, there remained no choice but to continue pedaling forward - but, the vibration and jarring, increasing in magnitude with each passing mile, began to echo through joints and bones - muscles tensed, shoulders tightened, and my speed had begun to drop. Even with my "giant" tires and forgiving steel frame and fork, it was a beating. Mere miles, which should have been dropping like files according to best-laid-plans, seemed to take eons. I switched to the gravel shoulder to see if the going would be easier. Not much. Glints of light in the sunshine reminded me that perhaps the shoulder of an old highway isn't the best place to ride, lest the break I enjoy from the pounding be at the expense of a spare inner-tube. At least gravel tends to get out of the way when one's front tire hits it, as opposed to the continuous, unforgiving jabs of millions of miniature potholes. I set my mind on Sparks, KS., one of the half-dozen ghost towns scattered along the western shores of the Missouri River; not because anything was there, but because I knew K-7 comes to a "tee" at a controlled intersection there, turning east slightly before continuing south. Logically, if the construction were to end and normal conditions were to resume, Sparks made sense. Just make it to Sparks... only.... gads... six more miles?! Rattle rattle rattle RATTLE RATTLE RATTLE R A T T L E !!! I started to bet with myself that my will would last longer than any of the myriad fasteners and bolts holding various things to my bicycle. Besides having to shove both water bottles, now empty, into my jersey pockets for having tired of constantly having to nudge them back down into their respective bottle cages, I was shocked nothing else had fallen off the bike. The grooves became deeper, sporadically changing direction all while whizzing by in such a way as to confuse the eyes. There was Glen, similarly bouncing back and forth along the way, about 1/4 mile ahead. What should have been an easy effort, the finishing touch on a nearly perfect ride, left us both wishing we were back on the heavy chipseal we'd left behind only a few miles before. Iowa Point came and went, and Sparks was next. As the intersection approached, I stretched a hopeful gaze to the left, looking for any signs of improvement ... but, it was not to be. We turned east, only to find the torturous conditions continuing. There are few sounds as uniquely recognizable as the satisfying "thunk" of a cold plastic bottle falling into the dispensing slot of a vending machine, and those muffled internal shuffles and rumblings that precede its arrival represent the very essence of human anticipation - just 1.5 seconds of patience seems too much to ask of us, knowing that our ice-cold liquid prize is finishing its mythic journey to the magical portal of freshly-vended flavor, mere inches from our eagerly extended hands. Conversely, there is nothing more disheartening than the sheer emptiness one is left with when pressing the vending selection button produces nothing more than the echo of hollow silence. Gutted, saddened, broken - we've all witnessed the labored shuffle of a person walking slowly away from an uncaring vending machine, empty-handed. Strangers point and laugh, a child lets go of her balloon, and our victim raises his eyebrows in sorrow, hopeful to shed a single tear had he not been left so, so dehydrated... WHY?!? I'd rarely seen Glen exhibit anything other than a cheerful disposition and patient demeanor for the hundreds of miles we've shared together over the last couple years, but as his hand repeatedly pressed each vending button in succession, each with the same non-result, cracks began to show across his normally calm facade. Sold out. Every. Last. One. So much for THAT plan. Defeated, we instead retreated to a shady spot alongside a nearby building, and took advantage of the extra water and bonk rations we'd brought along. Thoughts crossed my mind, but, instead I took advantage of the rest and tried to envision how far we sat from Troy, KS., south of US-36, and - uncharacteristic for me - off the route. It had to be done, and since our speed had dropped so dramatically since embarking upon K-7, it turned out we were no longer in any kind of hurry. Good thing, too: both Glen and I had gone from top-of-the-world to absolute mush in less than 15 miles. The temperature had risen to above 90ºF, first time this season for either of us on the bike in such heat, the pavement had taken its toll, and I had been out of water precisely long enough to feel the tell-tale beginnings of difficulty. Seven miles, though -- surely we could limp that. Limp we did. Heading out of Fanning, we endured more pounding until finally reaching the top of the one remarkable hill on this stretch of K-7, where smoother pavement finally resumed. The damage had already been done, certainly, but at least we could ride along without fighting for balance and sanity. More climbing as we moved from the "new" K-7 onto its old alignment, heading toward US-36 and, beyond it, Troy, where a c-store, drinks, and air conditioning waited. Cruelty, thy name is incline. Why must every c-store in every little town be at the top of some impossible grade, when I so desperately need it not to be? Delirious, I (at first) think I see a teenage girl covered in splatters of mud - which turns out to be real. A strange sight, apparently from playing around in a nearby creek or something, who knows - yet, that is the sight that greeted me as I dismounted next to the Troy FastLane c-store. Next to it, park benches and generous shade, which is where I found Glen. Ninety-three degrees now, per his computer. Removing my helmet, the signs of early dehydration are apparent in the deep dents across my brow from my head-cover. Normally, these marks will bounce back and the skin will smooth out after a couple minutes, but the skin doesn't behave this way in a dehydrated state. For me, anyways, this represents one of the early signs of trouble. Another trick, hold out your hand, palm down, fingers straight. Try to ignore the constant shaking (or is that just me, from all the coffee?). With your other hand, pinch some skin between your thumb and forefinger, right above your middle knuckle, and gently pull it upward, then release. It should, ideally, rebound quickly when you let go. If it is slow to rebound, this is another sign of dehydration - at least on a dermal level. Time to refill the tanks. If you wait for a headache, you're already past this stage. Of course, it's different for everyone. If you have no idea what your personal dehydration signs are, well... good: probably means you're drinking enough! Not the worst I've had; yet, considering how good I'd felt upon arriving at White Cloud, it proves how fast hot weather can work on a cyclist when fluids are not replaced. Didn't take long to get to this stage - flushed face, skin depressions remaining in place 10 minutes after removing my helmet, general wiped-out feeling. Find some shade, rest, cool-down, let the HR drop, and DRINK. 6:49pm on the clock. Wow... we had taken nearly two hours to cover 18 miles. Granted, it shouldn't matter, and with the time we had in the bank we were certainly not in any danger of missing a cut-off, but, this last section should have only taken an hour - possibly less given our performance leading up to White Cloud. Such is life, I suppose - but, the original notion of vanquishing the November performance will need to wait until KDOT comes to their senses. As Glen and I wrapped up our rest, topped off bottles and mixed drinks for the last push back to St. Joseph, only 16 miles back to the start from here - yet, who knew how much we really had left in the legs after the punishment of the previous hour. Glen had felt nauseated, and I just felt plain weird - a combination of an hour of hard vibrations and essentially running out of water and willpower. We both felt off, proving that it doesn't take much - usually just one little thing - to mess up an otherwise good ride. Right around 7:00pm, we pushed off. The best part of the last leg on US-36, compared to November's edition: the sun is still up, and is at our backs. More than plenty visible, and with a good shoulder, Glen and I turned onto US-36, and put the hammer down. sidenote..... I need to scour the maps for a town called "Jake" in KS, MO, IA or NE... the "Blues Brother's" permanent route depends on it! ...we approached the turn up onto US-36 underneath the shadows of four ultra-light aircraft, slowly making their way south about 200 feet above our heads. It was a cool moment, and reminded me that patience is an absolute virtue on these rides. I don't think that directly correlates to road speed, but to the mental state I sometimes get into when things aren't going well. Sure, it was bumpy - sure, we flushed our goal of a sub-12 hour finish - but, it was still a terrific day out on the bike, a bit of adventure, and a good story. The delays on K-7 likely spared us the brunt of St. Joseph rush-hour traffic, honestly. The last few miles of this route takes riders over the Missouri River on US-36, and past a couple entrance ramps joining 36 to adjacent highways nearby - which can be dicey. Today, instead, hardly any traffic awaited us. Slowly, legs beginning to protest, we checked off the last few turns and rolled up to Pappy's at roughly 7:30pm. With some distance between today and the ride, I'm simply chalking up to another one of those interesting elements that will probably make 2013 one of the best cycling years of my adult life. Out of all this weirdness -- snow, high winds, the heat that will surely come later this season, and the ridiculous roads we endured this time around... it all makes for some pretty good memories. More fodder for the I've-had-worse-files (which are bursting at the seams with six months of 2013 still left to go!)... I doubt I'll complain about "bad roads" any time soon, that's for sure. Kicking off R-12 #4 with a 600km ride in Iowa? Yep. The usual mental load of work and outside work are still keeping me away from the keyboard, so I at least wanted to get a photo-post up for this most recent ride, which marked #24 in a row - for R-12 #3, complete! I don't know if I touched on it after the last ride, but, having the Carradice saddlebag back in the arsenal is SO nice. I was able to just ride, and not worry about where to stow things - and best of all, it allowed me to keep the camera handy, for lots of on-the-road pics. WAY more than usual, which is a good thing. This helps with ride reports as well, and while this is something of a photo-dump for now, check back: I'll be adding notes later on, most definitely, because - especially for the last 25 miles or so - there remains much to tell. Prep begins: Glen in the mobile fortress.... a.k.a., zie RAAMwagen (a secret nickname I've given it, but really haven't uttered until now... muahahahaha!) No, that's not an announcement.. just a deeply unfounded and financially ridiculous pipedream... for now. Next to it, the SAG-Delux, now with roof-carrier! Thanks, again, Badger! Huh? The Dude realizes how much work it is to prep stuff out of a trunk, after months of riding from home. We began our tour promptly at 6:09am, after checking in at Speedy's c-store, and headed out onto quiet St. Joseph streets. It really didn't seem like a Monday morning... light traffic, but who's complaining? The early hills taxed my legs a bit - I never seem to get warmed up until maybe mile 20 these days, so early hills are always a bit "fun." Whaddayaknow? Not much, you? Face-shot, on US-59 northbound, south of Oregon, MO. A few layers still present , as thick, low clouds - almost fog - continue to blanket the morning. The scenery begins to open up, and distances between towns expand. Glen, cuttin' up the countryside - the reverse angle of the picture above, US-59 - headed into the expanse of northwestern Missouri. We made Oregon, MO. at about 8:20am, for a non-control refuel and refill. I like this little town - quiet, friendly, familiar. Good ole Americana. The hazy clouds of the morning begin to part and thin-out, as we cross the giant Missouri River floodplain, headed away from the eastern bluffs. Compared to November's version of this ride, the fields are no longer beige and sandy, but lush and green. The road converges to a single point in the distance behind me - the dead-straight run towards the state line on US-159. Glen, working the run-up to the Rulo Bridges on the Missouri River. I'd thought by this point the new bridge, 650 ft. to the south and out of frame here, would have been complete - but, we get to ride over the old bridge at least this one last time! I wish they were keeping it - once the new bridge is finished, this steel masterpiece will be dismantled. Thankfully, the railroad bridge beside it will remain. Here, you can see the new bridge at left. Unimaginative engineering, and not much higher than the old bridge. A rare treat, we encounter an eastbound BNSF coal train while on the bridge! Right at the state line, at about 9:45am, the sun finally comes out in full force, and the clouds disappear! NE-8 highway, westbound... under blue skies! Awesome views all around, as we hammer toward Falls City, NE. Meanwhile, it's a great day for a ride! On NE-8, headed back toward Kansas, a smaller version of the Rulo Bridge gives another visual treat. This one crosses the Big Nemeha Creek near Salem, NE. Glen on point! Here, Glen and I proved ourselves as a solid pair, each taking multiple-mile-long pulls on NE-8, at times holding steady at 20mph, with a very slight tailwind helping. Nutrition proved excellent, my saddle near perfection, and push consistent. I don't know if I've felt stronger this year, so far, than on this section. Glen, pausing at the NE/KS border on US-75 southbound. There's still construction about, but it's a much better road than we rode in November '12. Pause for the cause, at Morrell, KS. The only services, a pop machine and a bench in the shade -- which is all I really need! The look is confident, and of enjoyment - a nice change from previous rides! In my personal notebook of strange nutritional combinations that work well on rides, today's entry is Mountain Dew and Mounds candy bars. Weird, but I'm not questioning it. On this stop, I tried a Bonk-Breaker energy bar... these worked well, too. Glen, feeling good and fresh on 310th Street, east of Reserve, KS. Compared to November, the monster chip seal is manageable, the light winds perfectly cooling, and the legs feeling strong. The solid thumbs-up and beaming smile sum up the ride - to this point - perfectly. Happy, strong, fresh, feeling great, and absolutely loving randonneuring. This one needs submittal to RUSA's photo-blog, I think! Another great shot - the road looks almost like gravel, and feels about like gravel - but we don't have a care in the world! ...feeling good enough to screw around with the camera, to try out a couple of panoramic shots! This shot was accomplished using Apple's panoramic feature on an iPhone 4S. Starting at the left edge, the feature is activated and the camera is slowly panned left-to-right. As the sweep occurs, the image is composited along a common horizontal axis, and the result is a puzzlework of individual photos which are joined along this line. In the case above and below, however, I was moving forward at 16MPH -- while the horizon line stayed relatively steady, the items in the foreground begin to have problems joining together, so, the result is a segmented image - similar to what some early NASA photos from the Mars rover and Voyager spacecraft images. It managed to compress and slice Glen, and part of my face - as well as the roadside edge, grass, and clouds. Since the image file still had "room", I continued the sweep to the right until the camera ended up facing me directly, which is why I appear to be looking into the shot from the right - when I'm actually nearly directly behind Glen. If travel approaching light-speed where possible, one's brain would (in theory) construct a similar image, as things approaching and things one had already passed would appear to be visible at the same moment. That's a bit deep... but, it won't prevent me from attempting to print this in a large format and affixing to the wall in my man-cave. If nothing else, it captures the vast openness of the NE KS plains. Though I don't like this one as much as the one above, these two are my favorite shots of the day, and maybe ever. Not perfect, no - but it really gives a sense of NE KS, how awesome the sky looked, and the aloneness and alien-like experience of riding a bicycle across such a landscape. White Cloud is a spectacular route! This shot was actually taken about 45 seconds before the shot above. Here, Glen is still next to me - where in the shot above it, he's passed me. It nearly, however, completes a full 360 degree view around my head on 310th road, somewhere east of Reserve, KS. It will take a far steadier hand to get a true 360 shot with my head on-center - but, I'll be trying in the future, for sure! After the fun of the camera, we checked off the remaining miles to White Cloud, KS., and the Tee with K-7, marking our final run back to the finish. In November, I managed to recover from the chipseal pounding and up my pace to a degree that would help salvage a decent, though difficult, finish. THIS day, we had been planning on the same, yet the difference lay in how fresh we'd been compared to the November version. I felt strong, fresh, ready - and Glen and I both knew we were on-target for a sub-12 hour finish, perhaps. It had been a near-perfect day, nutritionally, and it reflected in our riding. Until we hit White Cloud. This is where the pictures stop, and the tale begins... a reversal of fortune neither of us saw coming. Arriving at K-7 and Main street at White Cloud just a hair before 4:00pm, with light winds and hot - but bearable - temps, Glen and I said "hello" to the river once again, and turned south. The short version, yesterday's White Cloud 250km permanent ride from St. Joseph, MO., to Falls City, NE. and then over to White Cloud, KS. on a short ghost-town tour marked the 12th consecutive 200+km ride for me, since last June. That officially makes it (when my card gets its final stamp, of course) R-12 #3, finished! I wish I could call it "R-36" without an asterisk by it - which refers to my first R-12 being off by itself back in 2008-09, then a break, and then picking things back up again in 2011. Still, I guess, technically, that's 36 rides for a total of the three R-12 awards... even though right now I'm really only on R-24. Whatever. I'm happy! Photos tocome, hopefully while the memories are still fresh. It was - all in all - a great day for the 200k. The last 50km, however... good grief. I'll likely limit the tale to photos, and focus on the last 26 miles or so from White Cloud back to St. Joseph. It proved to both Glen R. and me that it doesn't take much to completely change the face of a bike ride. It ended up being a hard-earned finish for both of us. ..but, you know what they say. For now, it's down to resting, rehydrating, and trying to get my digestive system back on-line. It's been an interesting month, which I'll also get into. Especially considering I hadn't started a brevet with exposed knees and uncovered fingers since last October, watching the forecast for this latest ride proved to be a smile-widening experience. Even the morning forecast low in the upper 40's couldn't get me down, with highs showing in the upper 70's and the promise of a tailwind return. Sweet! Even the thought of riding the "same old route" didn't bother me - a clear contrast to the last R-12 run, I hadn't ridden the Border Patrol 217km route ... ok, since February: but, with the rain and double headwind, that one (in my mind) doesn't count. Prior to that, however, it had been a long time embarking upon this home-turf run. The bonus: three others came along for the ride! At left, Arlys's custom, tall, Ti, chrome-fendered, gen-powered, disc-braked, Spot-Tracked, and GB-front-bag'd rando-machine. R-Wark, are you taking notes? Glen's cleverly-adapted Rando-Pinarello in blue, and the tail-end of the Kogs, now sporting the rando-appropriate Carradice togs. We rolled out a couple minutes after 7AM, onto busy suburban streets, dodging cars and SUVs and school buses as the morning commute unfolded around us. It felt weird to ride on a Monday, but, somehow rewarding. No matter what would happen, I wasn't sitting at a desk. Can't beat that! With a steady rush of traffic on 175th, comprising the first eight miles or so of the route, we all settled into a silent rhythm. It proved difficult to hold a conversation over the constant din of 55 MPH flybys, so we all just pedaled and took in the lush scenery north and south of the busy thoroughfare. Soon, we turned south, into tranquility - Antioch Road and the first climbs of the day, leaving the traffic snarls behind, and greeting the countryside. For once, maybe it's the cross-training, the dietary changes, the attitude... or perhaps it's the new saddle (more on that later)... but, Antioch's hill didn't seem quite as steep, and I didn't feel quite as winded as the last time I'd ventured out that way. We caught sight of a blue heron taking flight from a small, secluded private pond... an awesome sight, but too quick for cameras. We made our way through Stilwell and onto the long stretch of Metcalf through Louisburg - Glen taking point and making short work of the run to the Miami County line. The slight headwind didn't prove too daunting, and for once I was managing to hold Glen's wheel as we ate up the road toward Louisburg, chatting away and enjoying our surroundings. Glen and Arlys weren't far behind, but the day would unfold as a game of cat-n-mouse control leapfrogging instead of a true group event. 8:50 AM, Louisburg, dash-n-go and a bottle refill. The morning sky gleamed brilliant blue above us... it was going to be a great day out! ...which is probably why I remember so little about this ride... which prompted Glen to start asking what kind of weather challenge would befall us, later on down the road. Hmmm.... SOMETHING interesting would have to happen, or there'd be nothing to write about! The sun and temperature rose higher, and Glen and I played gravity-tag, enjoying the long downhill into La Cygne, KS. for the first control. After months of slog, weird weather, chills, impossible headwinds and other challenges, it felt amazing to uncork, and just ride for the sheer enjoyment of it. No complaints! An awesome morning - at La Cygne, KS. Departing the control for the halfway to Pleasanton, there was nearly nothing to worry about... again, makes for REALLY short posts and boring reading; but, that's okay by me. Still engaged in control cat-n-mouse, we kept in touch with Arlys and Terry as they'd pull into the controls only a handful of minutes behind Glen and me. The temperatures were nearly perfect - not too hot, or cold. Sporting the short-sleeved wool KCUC jersey, I'd never been more comfortable. Adding to the comfort, the new saddle felt good... but not quite "perfect." Surely, a few millimetric tweaks would be needed, and I began to wish at a couple points that I'd brought the right tools for the adjustment job, instead of the short, compromised repair tools in my bag. Finally, having a Carradice bag behind me again -- just like I'd predicted -- put the icing on the improved cake. No more squeezing items into a cramped (though still large by most standards) seat bag and struggling to get the zippers closed. No more worrying about where to put shed layers or extra bonk rations. Even better than I remembered from the last time I'd ridden with a good saddlebag, having a saddle with bag loops creates a much more stable load - compared to the seatpost quick release I'd used years before. Since I'm not using the saddlebag for commutes, the QR feature isn't really missed. 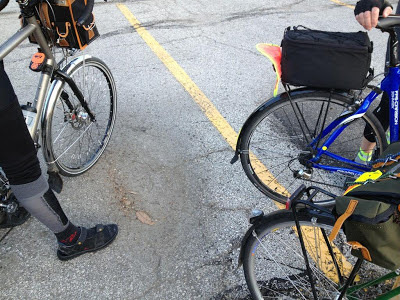 The bag, as a result, sits lower, closer to the bike's center of gravity, and the rear rack on the bike serves perfectly as a saddle-bag support for the load. I can't even tell the bag is back there while riding, or climbing out of the saddle - and the added flexibility and ease of use at controls...priceless. It's not the "end-all" front-rack, decalleur & handlebar bag I've often dreamed of, but compared to what I'd been doing it's perfect. Perhaps the best part: no more stuffed back pockets on my jersey. Combined with the improved comfort of the saddle, rider enjoyment has gone up considerably. I honestly don't have a single thing on my equipment wish-list now. Maybe I can finally just get to the business of riding the bike? That's a good feeling. Lunch in the shade. Glen R. pulls up a seat, and enjoys the gentle breezes under a shade tree in Pleasanton, KS. at the halfway mark. With only a few short miles of a crosswind to deal with, we departed the halfway at Pleasanton for the return trip to La Cygne, putting the last of the big hills behind us under amazing skies, tweeting birds, and light traffic. I didn't have any Superman-moments on the climbs, but felt better than I had in many rides - controlled breathing, and slightly more energy and speed. I don't want to sell-up the idea of the saddle being responsible here TOO much - it's all very, very individual, as most folks reading this will already know. However, my previous saddle had begun to hit me incorrectly in a particular area, ultimately resulting in some pain, and occasionally some mild numbness. While this was never problematic in a clinical sense, it did create a level of fatigue which would certainly cause a drop in speed and "push", depending. As a randonneur, I expect a certain amount of discomfort. It's inevitable - and I had become largely complacent about trying to adjust it out, especially in the aftermath of "the fit issues" of 2010 -- probably my obsessive personalities' all-time low point. After a couple small tweaks, I'd simply resorted myself to the notion that the saddle had just become old, broken-down a little, and no longer felt as good as it once had... but, it was still likely going to remain the most comfortable saddle I'd be able to find. So, about the same 30-40 mile marker into each ride, the pain would come and stick around... and so, I 'd just pedal through it. Life goes on. After a while of tolerating this, of course, here we are today: things reached a point on the Oak Grove 300k, after hours of seated deathmarch into a ridiculous crosswind, that I finally let myself fall over the edge into New Saddleville. Why I waited so long.. well, I'm just stubborn. I think it's a safe bet to assume that no cyclist prefers changing saddles. One never knows what one will get, and it's a hassle. So far, I've gone through the slow progression of small adjustments to arrive at a good location... one more tiny tweak may be needed, and the surface is slick (mainly because it's still new), so I'm sliding around a bit.... but, the partly-numb, partly-inflamed soreness area brought on by my old saddle is long gone, and I feel like I'm actually sitting on my sit-bones -- where I should have been all along. Always read that, always heard it... but, like I'd mentioned in previous posts: either I changed, or the saddle did, or a combination... at some point along the last ten years, I stopped getting the correct saddle support. Now, I can actually look to things like a 600km ride, and see it as a largely positive experience. The last thing I'll say about saddles: the right saddle has almost nothing to do with price. It has EVERYTHING to do with personal comfort. If cycling hurts, it should hurt your muscles... NOT your body. If the stock saddle doesn't work, get advice from your LBS, your cycling friends, etc. It may only take the adjustment of your current saddle, but it may take a new saddle design, or width. Patience and persistence pays off. I have tried out $300 torture-devices disguised as carbon race saddles, and I end up with $30 rummage-bin saddles that I still hold onto today for beater bikes because they're so comfy for me. For the long-distance bike, though, I happened toward a randonneuring-style touring saddle constructed from very old-school methods (leather) based on many recommendations from my cycling peers and after reading posts from well-respected reviewers. I had been prepared for it NOT to work, based on previous experience with leather saddles; but, at this point, I really don't see myself sending this one back to the vendor for an exchange. Dude, captured at the home-away-from-home: Casey's General Store. The sun is out, and the smiles widen! Heading back toward Louisburg, with a tailwind helping along, Glen began to get away from me a bit, so I ended up managing a lot of this section as a soloist. The Border Patrol route, one of these years, will be redesigned - slightly... I'm still waiting patiently for Miami County to respond to my letter-writing campaign to pave Jingo Road from 327th to 359th streets, so, until they come to their senses, 3 miles of the ride takes place on US-69 highway. It's bicycle-legal, with a large, 8-10' paved shoulder, separated from traffic with rumbles... but, the good kind that don't extend all the way across the shoulder. Still, with 70MPH traffic nearby, it's possibly the least enjoyable part of the ride, in my opinion - there's simply no way around it, and it's never really too bad. It's a love/hate relationship: on the outbound, I don't like it. It's uphill, usually windy, and seems to take forever. On the northbound return trip, however, it's all downhill, and the wind has usually picked up... so I end up LOVING that part! Glen was really loving it... at times, I'd peer down and see 28 MPH of tailwind fury.... and Glen would still be slowly, surely, pulling ahead, making the most of his top gear. For all the seclusion and traffic-free tranquility that Jingo Road's eventual paving will someday provide, it won't quite be the same slingshot this highway section has proven to be on the right day. One sees the 70 MPH sign, and actually smirks at the fleeting hope that it might be achievable... just 20mph more wind, and a 54-tooth chain-ring... mmmmm ... remove the highway traffic, and it becomes the BEST part of the ride. Back at Louisburg, it started to become almost "hot" - though none of us were complaining. Sports drinks guzzled and more calories on-board, I fueled up to ensure a good finish. I think I traditionally fall short in the last 25 miles of this route, because I keep thinking "I'm home" or something similar .. the home-turf phenomenon? I put the curse to rest with a couple Hammer Gel shots, a couple Fig Newtons and a bag of chips. Time to wrap things up. Even though Glen and Arlys again appear at the control only a handful of minutes later, they wave Glen and me ahead - insisting they'll slow us down. They're too hard on themselves, I think... sure, we hadn't ridden much with them, but they caught us at every control! Glen and I turned north again, and checked off the intersections.... 279th, 247th, 223rd. Re-entering Johnson County at 215th, I felt surprisingly fresh and nimble - energized by the warm air and seemingly effortless floating pace Glen and I maintained along Metcalf, I stood up and climbed on hills - even though it wasn't always comfortable, I pushed my limits a little bit - instead of feeling like I'd been on damage control. The fast downhill on Antioch was a thrill, and soon only 175th street and the short trip north on Murlen Road remained. 5:37pm for the finish, with Glen perhaps 6 minutes earlier, displaying that "smell the barn" last kick again. Not a bad finish - and much faster than the last few rides, for sure! A cold chocolate milk, and big congrats to Glen for wrapping up his first R-12 with this finish! Yeah, not much "exciting", I suppose... but, I'll take it. Finally.... a ride that seemed to REFRESH the mind, rather than tax it. I could have just summed it up that way. Can't wait for the June ride! I wanted to take some space and congratulate my son, officially in these pages, for having finished his first metric century this past weekend! 64 miles at a hard-earned 9.9 MPH average, on a hilly course with headwinds and some drizzle. Considering his longest-ever ride prior to this sat at 40 miles, it's a huge accomplishment - moreso considering the heavy, steel, converted mountain bike, flat bars, flat pedals and tennis shoes he'd used to finish the job. I'm giving him an opportunity later this month to help me chronicle the ride from his OWN thoughts - not mine. He's not confident with the keyboard quite yet, but I think therein will come an interesting innocence and perspective - most of the content might come from a transcribed, casual interview, but little will be done by me to fluff-up his words. It's with some trepidation that I'm excited about some of his first questions, post-ride, though... normally, not something to be discussed immediately after a long, tough ride (which, for him at times, it had been very tough). His first questions involved what a couple months ago he'd seen me reading in American Randonneur about the P-12 program. Sitting comfortably in the car while I packed things up, sipping his remaining sports drink, I could see his wheels turning. He knew what he'd just accomplished, and was somehow smiling, and already thinking about the next one. Surely this will only last as long as it takes for him to tighten his fingers around his first set of car keys, but, if he's in, so am I. The timing is pretty good, too, considering it seems I've finally put the final touches on MY rando-bike for a while, it would appear there are several changes needed for HIS ride before our next outing... so the wrenches will remain warm in the garage. Sweeet. I love a good project bike. I have just the frame, too -- once saved for the wife (and never traded, sold, or discarded for the same reason...hung on that fleeting hope), there is a 48cm Bianchi road frame waiting to be let loose on the road again. It was graciously handed over to me by Cameron Chambers, once at Bike Source and now out in Colorado occupying the upper podium steps of the regional mountain bike racing circuit when he isn't coaching at Carmichael Training Systems. His wife had been using it for a while, and upgraded - so he offered it to me in good health, and I've had it ever since. The tape measure confirms my suspicions, and the parts are laying ready... its time has finally come. The best part, perhaps? After a steady diet of Top Gear and Road & Track magazine, my son is becoming as much a car snob as me. For him to be able to tell his friends that he's piloting something red and Italian before he's even got his driver's license?? Dude. So, stay tuned...and thanks for reading!